Rob is away which means I have been left to my own devices. I stay up a lot later when Rob isn’t here to remind me to go to sleep. I am the one taking care of the garbage, mail and laundry. I haven’t vacuumed yet, but I think that’s ok. We stocked up on groceries before Rob left, so I had a fridge full of produce to work through. I have been eating my greens, but most of the time, I have been thinking of the dessert that awaits afterwards. Since moving to Houston, Rob and Joe have been a bad influence. You have likely met Joe, too…. the Trader Joe. When we first moved here, we were enamoured with vegan ice cream. We knew that habit wasn’t sustainable, so we weaned ourselves to smoothies and banana ice cream. Next came the chips. TJ’s has SO.MANY chips to try. The gateway chips were the black bean and quinoa ones, and then we progressed to the veggie and flaxseed tortilla chips and soy and flaxseed chips. I have put a chip ban in place while Rob is gone, although I will admit I like the chips more than sweets. And then Rob discovered their vegan cookies. They even say vegan cookies right on the package. I knew I had to put an end to this madness. Even homemade cookies would be a better option. Although, I purposely did not bring any baking contraptions to Houston. (I can’t even find my graduated 1-cup measuring cup, sigh).. and strictly enforcing a no flour pantry (chickpea flour and masarepa, excluded). What’s a cookie-loving girl to do? Peanut butter cookies to the rescue. Peanut butter and wait for it, mashed chickpeas, are the base for these cookies. I chopped up some chocolate to incorporate into the sweet batter. Now we had peanut butter and chocolate chip cookies! I am no stranger to beans in cookies, either. One of my favourite cookies are these chocolate mint cookies made with black beans and these chocolate chip chickpea blondies were a hit, too. I like bean-based cookies because they are softer and more cake-like, instead of hard and crackly cookies. They certainly have a different texture but you would never know there were chickpeas in them. 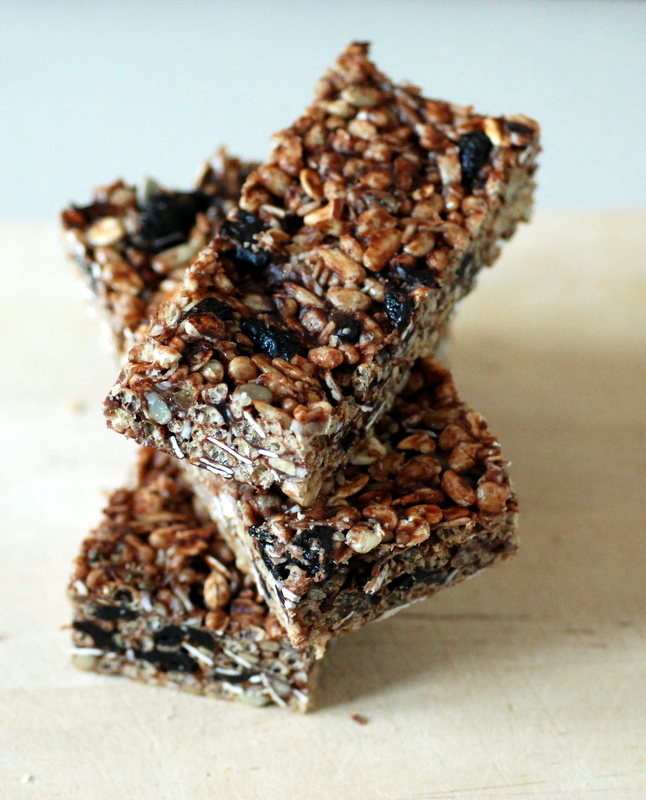 These would also make a nice snack while cycling/exercising – a nice change of pace from date-based treats. Have you baked with beans yet? This is my submission to to this month’s Bookmarked Recipes, Virtual Vegan Linky Potluck and to this month’s Credit Crunch Munch. I am a bad vegan. I didn’t know November 1 was World Vegan Day, to kick off World Vegan Month. I’ll change that right now. 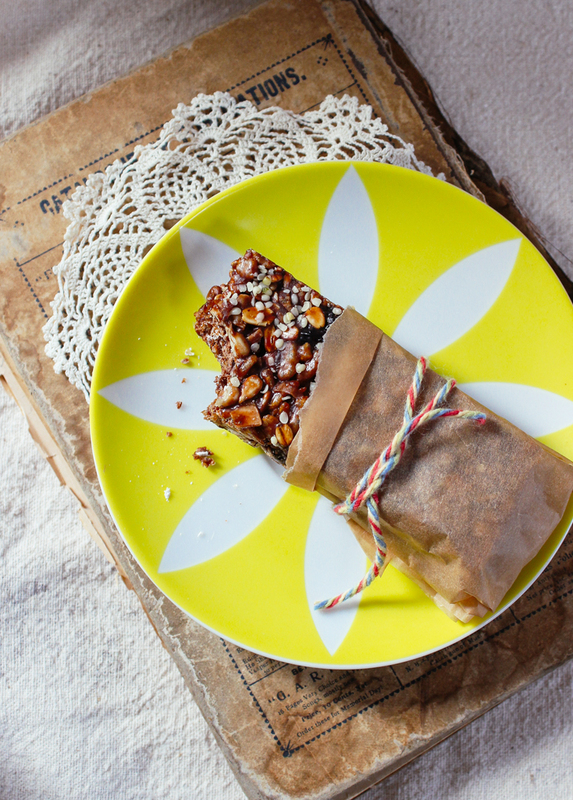 What better way to share vegan cheer than by spreading some vegan desserts? I went a bit dessert happy last week and made not one, but two desserts. Both with secret ingredients. First, we have these blondies. 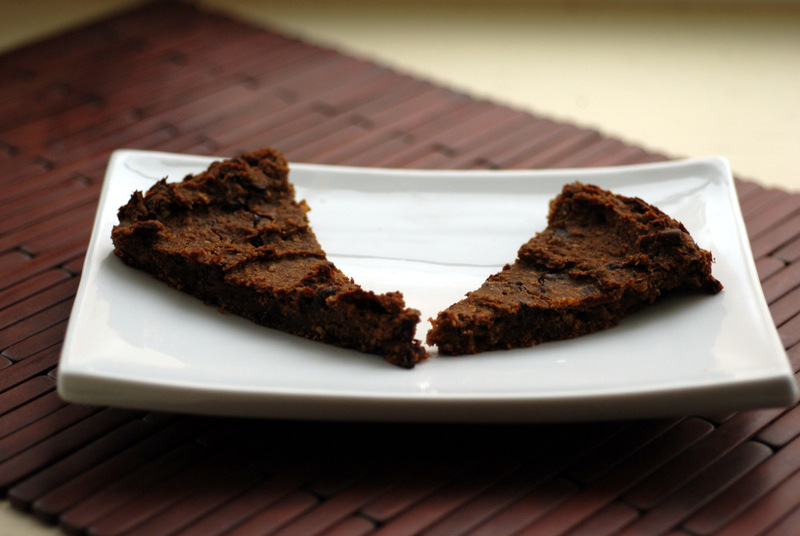 Fudgy and moist like brownies but without any cocoa. 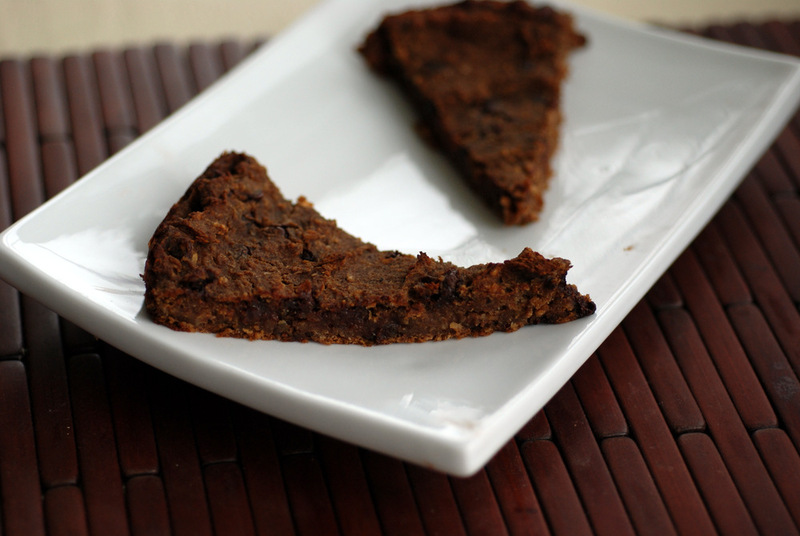 Speckled with chocolate chips and sweetened with dates, you have a delicious dessert. 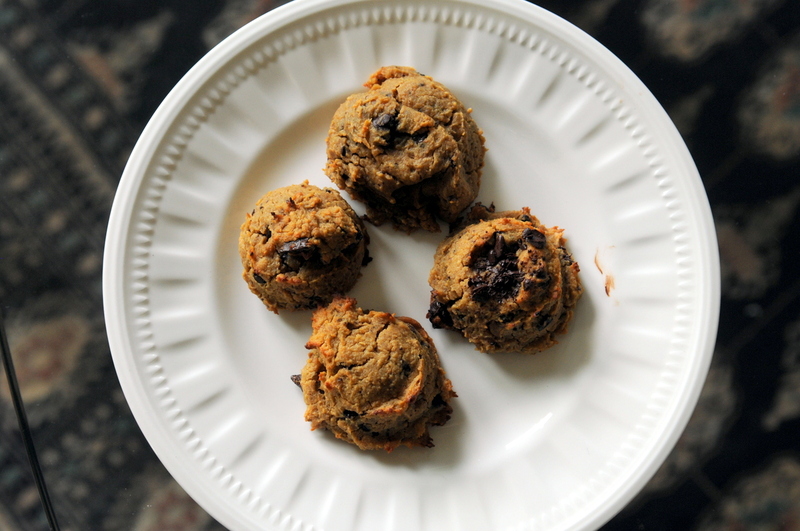 Nut-free, to boot, these treats are made with chickpeas! 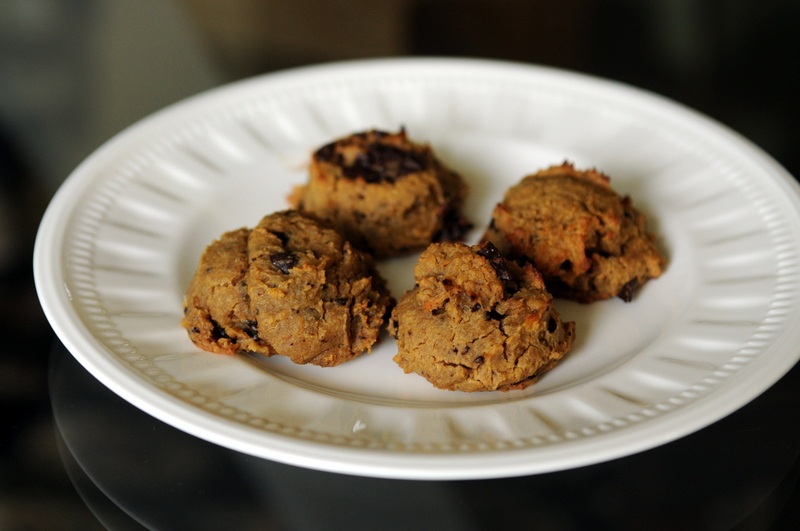 I first tried baking with beans when I made chocolate black bean cookies last year. Deliciously moist, creating a cake-like consistency. Without a hint of beans, the beany cookies were definitely a hit over Christmas. 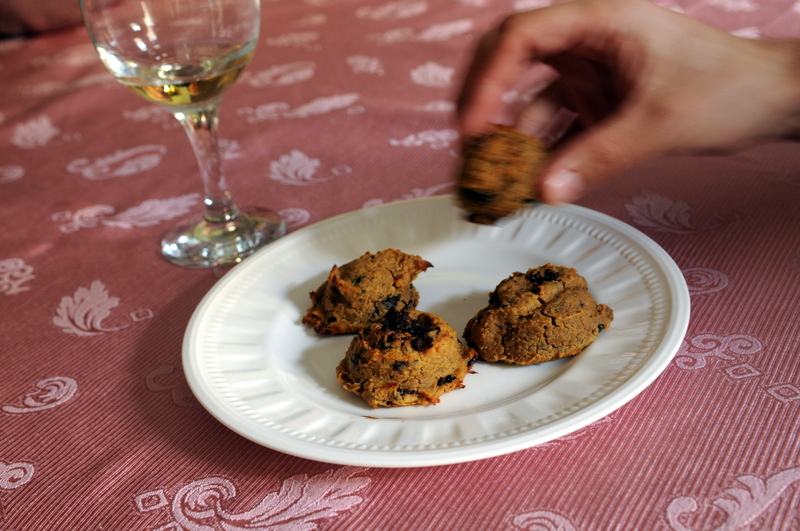 This time, the chickpeas contribute to a moist filling along with the dates. Chocolate chips speckled throughout made it a nice treat. A momentary lapse caused me to inadvertently double the wet ingredients, so I ended up doubling the recipe and making 2 pies. After chowing down one pie in 2 days, I knew I had to share the second pie. I had to say goodbye. I put some leftover cake and brownies in the kitchen on 5. There’s not much there. Get it while you can!!! Little you knew I sprinkled bacon bits over both… muhahahaha. Actually being evil! For some reason, he didn’t disclose there were chickpeas in the blondies and whole wheat flour in the cake. I think that would scare off more people than telling them it was vegan, right? 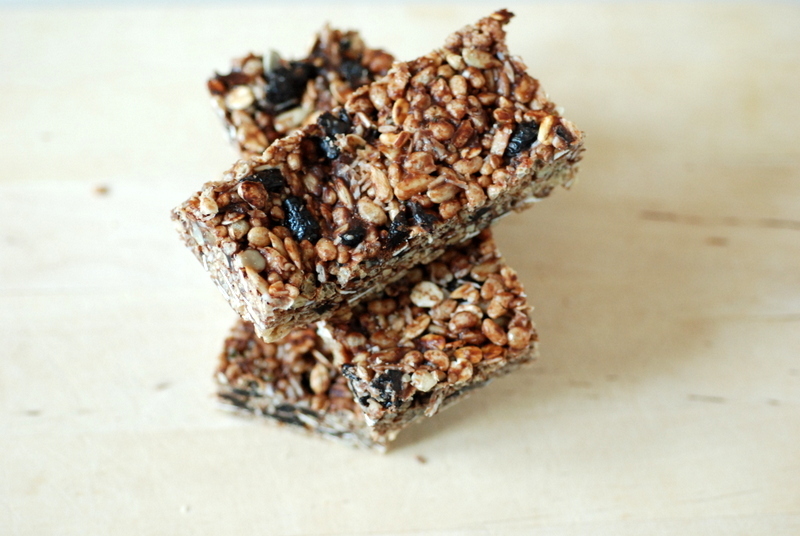 Healthy does not have to mean taste-less. If a group of twenty-something men devoured them, I bet you would enjoy them, too! Did you celebrate World Vegan Day?